@niandra3 Thank you very much for getting back to me so quickly! Let me give you a bit more info: First of all, I am using the theme on a 250C device. I am using SS coils on "Replay" profile (the default Evolv profile). When I navigate through the menu to "Preheat", the Power value is visible (set @300W), but I cannot change it. At the same time, "Punch" slider can, indeed, be changed. Is it possible that Preheat Power is not accessible/active with Replay? However, the value is there. Apologies if my question sounds naive Thanks a million! @niandra3 Thank you for the great theme! 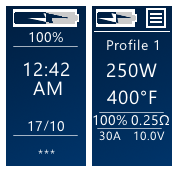 One quick question: I cannot seem to find how to change the Preheat Power value (by default set @300W) in the respective screen. Any advice? Many thanks in advance!